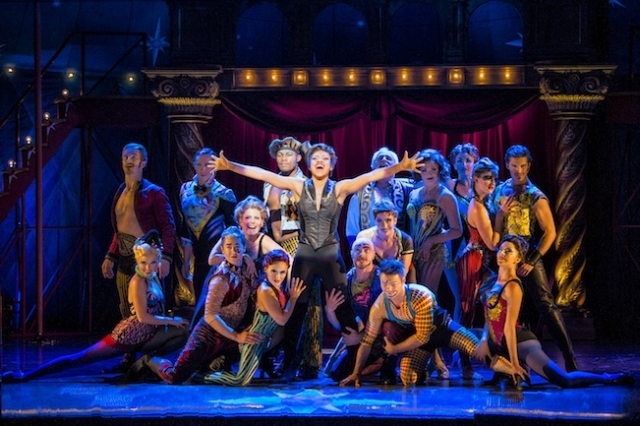 Pippin is Broadway’s high-flying, death-defying hit musical, complete with extraordinary acrobatics, wondrous magical feats and soaring songs from the composer of Wicked. This new production is the winner of four 2013 Tony Awards® including Best Musical Revival. This captivating new production is directed by Tony winner Diane Paulus. It features sizzling choreography in the style of Bob Fosse and breathtaking acrobatics by Les 7 Doigts de la Main, the creative force behind the nationwide sensation Traces. Kristine Reese, who plays Catherine in Pippin, is a Minnesota native who recently visited the area in the previous touring production of Wicked as Nessarose. Reese made her Broadway debut in the 2006 revival of Les Miserables, and understudied the role of Sophie on the National Tour of Mamma Mia! Raised in a suburb of Minneapolis. MN, Kristine currently resides comfortably across the Hudson River from Broadway, in New Jersey, with her husband, fellow actor Billy Tighe. It’s got to be great to return to your home turf in Minnesota. What’s that like for you? Kristine Reese: I love coming back here, not only because it’s my home town, but because I just love this city. There is so much happening here, plus there is a ton of incredible restaurants and a very enthusiastic theatre community! I also love being able to share my life with my family (my brother and sister-in-law still live here) and my friends. What makes the character of Catherine so interesting to audiences? KR: Catherine refers to herself as an “ordinary kind of woman,” as if she is boring and plain, but she couldn’t be further from that. She is quirky and endearing — she should make you both laugh and cry, but ultimately, she is the representation of humanity of the show. 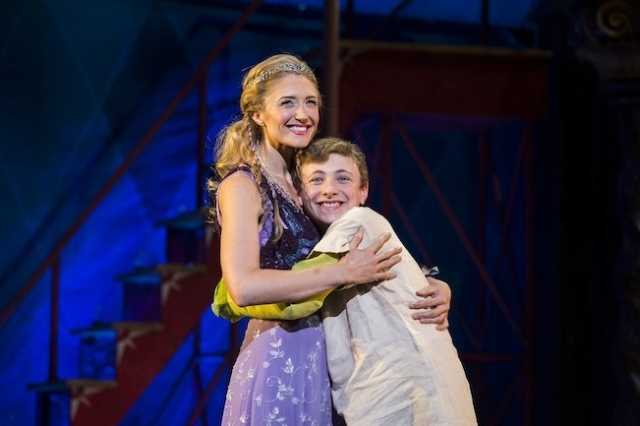 There is a lot of spectacle in this Pippin, but she offers Pippin something real, which is what he is so connected to. People want to be entertained when they see a show, and they will certainly get that with Pippin, but I think people see themselves in everything about Catherine, and that really resonates. You’ve wanted to play Catherine for a long time, since Pippin‘s revival. Any other dream roles? KR: As I get older, I add more roles to the list, but really, and I know this is a boring answer, I just want to play interesting and/or complex characters. Catherine was a dream role, and she is actually very complicated — I think it would be hard to play another role that isn’t so layered now that I’ve done this… I just want to keep working every night! But I think if I HAD to name a few, I would love to do Nellie Forbush in South Pacific, Ellen in Miss Saigon (I am obsessed with the new London revival! ), Fantine in Les Miserables, the Bakers Wife in Into the Woods. You’ve got a musical theater family, with your husband also touring the country performing in shows, which has to be hard. Is that a typical part of the business? KR: It can be. As you can imagine, marrying or dating someone in the business is common because our lives are in alignment — people in the business have similar schedules, interests and lifestyles. But, it can also be really difficult. I think you have to have a LOT of trust, discipline, commitment, and more LOVE than you can possibly imagine to really make it work. My husband and I have to schedule our time together — even our phone calls — as he is currently playing Elder Price on The Book of Mormon tour, and we both spend a lot of our energy doing our jobs. Sometimes when we both are vocal resting and steaming after our shows we will FaceTime to see each other and then type on iMessage…we are so weird. But you have to do it! You have to make that commitment to communicating. I don’t know how uncommon our particular situation is, but I can say we have been together for almost 12 years and most of it has been long distance as we’ve been fortunate to both be working actors and the work often isn’t in New York — and we are more in love than ever. So, maybe that is what is atypical. Making it work. You were an athlete before being encouraged to go the theater route. Was that a natural transition? How much do you rely on your athletic background when you perform? KR: Honestly, I don’t think it was natural at all. I don’t know too many people that have had the route I’ve had. Most of my coworkers and friends in the business started at a very young age taking ballet and singing lessons for many years before then going to the university level. But, I think my sports background (Can I call it that?) has helped me immensely in so many ways. I think a lot of the same lessons you learn playing both individual and team sports are applicable to the “business”: discipline, respect, team work, and that not everything is fair. Sometimes you don’t win, and sometimes you don’t get the role, but you keep working on yourself and you can ALWAYS get better. I am so glad I had the journey I had. I feel that I am a very well-rounded human because of my unique experience and that makes me a better artist. Pippin runs at the Orpheum Theatre through February 22. For more information and to purchase tickets, head to www.hennepintheatretrust.org.